Better Block is more than meets the eye. The street transformations often steal the show, but the real community and lasting economic change is found in the pop-up shops and vendors that test markets, refine business plans and build followers during the event. The first two Better Blocks in Dallas have resulted in two permanent businesses that began as pop-ups. 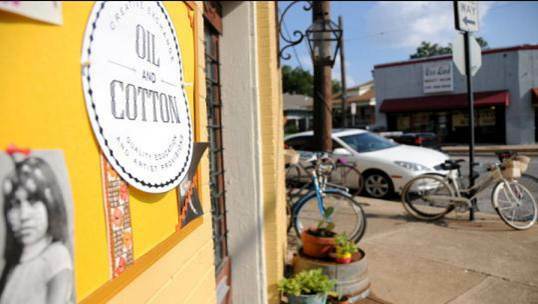 Oil and Cotton co-owner Shannon Driscoll says, “We had always wanted to start an art studio, but we did not know if the area could support one”. The Better Block tested the market over a weekend last April and the business is now thriving with classes and retail sales and is expanding to a neighboring space. Pegasus News reports that the expansion brings another Better Block Pop-Up Shop to life, WIGWAM! Beyond these brick and mortar establishments, the second Better Block in Dallas seeded a mobile food vendor. The HotBox served drinks at that event and had a full menu at the Food Better Block in the Dallas Arts District only a few months later. Is Better Block the next model for the evaporating Chamber of Commerce?